A telescopic crown-retained removable partial denture has a positive impact on a patient's well-being and quality of life especially in patients with few remaining teeth. In modern dentistry, though implant or fixed prosthesis is the better option, the implant to every patient is not possible due to biomechanical, esthetic, medical, or economic reasons. In other cases, there may not be enough teeth present to support a fixed prosthesis. To avoid any compromise and ensure a good result in such cases, we chose a removable telescopic prosthesis on natural teeth. Telescopic denture also known by following terms such as double crowns, frictional fitting telescope, telescope with clearance fit, the Marburg double crown system, and conus crowns has proven as an effective means of retaining overdentures. They transfer forces along the long axis of the abutment teeth and provide guidance, support, and protection from movements that might dislodge the denture. This treatment modality is essentially a preventive prosthodontic concept, which is a conservative manner preserve the remaining teeth and helps in conservation of alveolar bone ultimately. Retention of one or more teeth offers the patient a lot of advantages such as better stability, retention, proprioception, support, maintenance, of alveolar bone, and psychological aspect of retaining teeth. There are two tenets related to this option, the first, constant conservation edentulous ridge around the retained tooth, and the second, the most important is the endless existence of periodontal sensory action that directs and monitor gnathodynamic task. In this option, the primary coping or inner coping are cemented on the prepared tooth, and a similar removable outer or inner telescopic crown placed tightly using a mechanism of tenso-friction, this is firmly attached to a removable RPD in place without moving or rocking of the prosthesis, which is the common complaint of almost all the patients of RPD. Copings are also protecting the abutment from tooth decay and also offer stabilization and maintaining of the outer crown. The outer crown engages the inner coping and gives as an anchor for the remaining dentition. 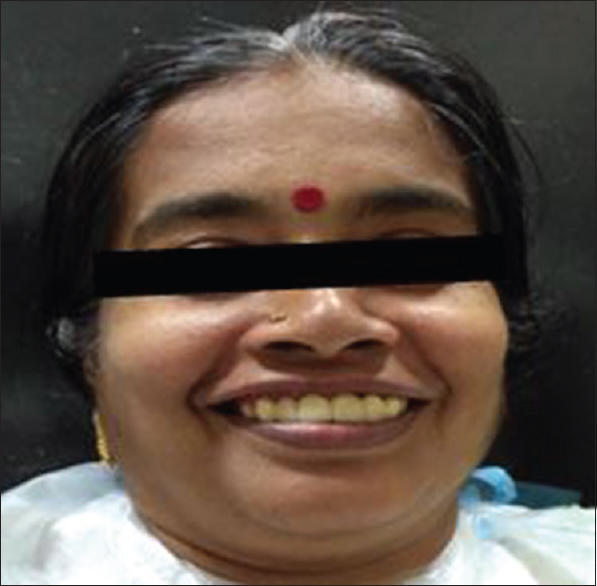 This clinical case describes the management of partially edentulous patient with a telescopic maxillary denture and fixed prosthesis in lower. 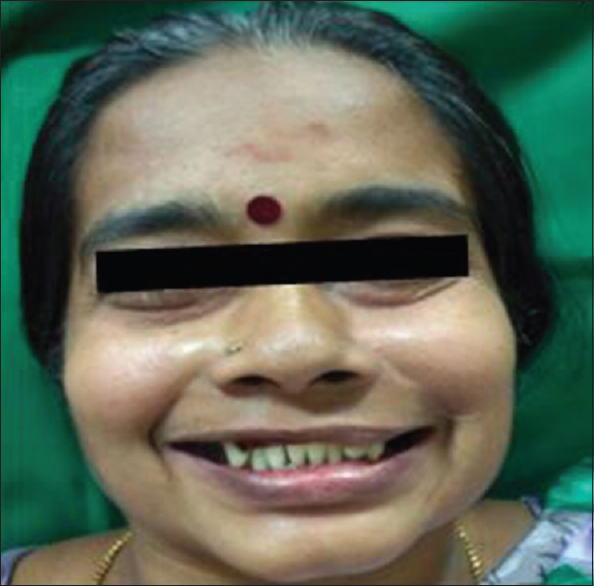 A systemically healthy 49-year-old female reported with the complaint of missing upper and lower tooth [Figure 1]. Intraoral examination revealed that the teeth present in maxilla were 12, 13, 23, square arch form, u-shaped hard palate, and Class I soft palate [Figure 2]. The edentulous span had favorable ridge with firmly attached keratinized mucosa. Moreover, in mandible with, root stump in 36, dental caries in 35, 37, and missing 46 [Figure 3]. The diagnostic cast was prepared with alginate impression (Tropicalgin, Zhermack, Italy), articulated on a semi-adjustable articulator (The Hanau Wide-Vue, Whip Mix Corporation, Louisville, KY) using centric record, and a facebow (The Hanau Spring-Bow, Whip Mix Corporation, Louisville, KY) transfers to evaluate the interarch space. The vertical dimension of occlusion was sufficiently maintained, as the patient was wearing an interim denture ever since the teeth were extracted. After taking patient's consent, treatment with oral prophylaxis, extraction of root stump in 36, The tooth used as abutment was gone through elective endodontics 12, 13, 23 [Figure 4], as radiological it revealed that abutments are having sufficient bone support, and hence, the endodontic rehabilitation of the abutment teeth was completed so as to use for abutment for overdenture. Abutment teeth were then prepared to receive thimble-shaped (long coping) [Figure 5], and impressions were made with putty and light body using a stock tray. The cast was poured and was surveyed with the wax pattern to achieve parallelism in all planned abutments. 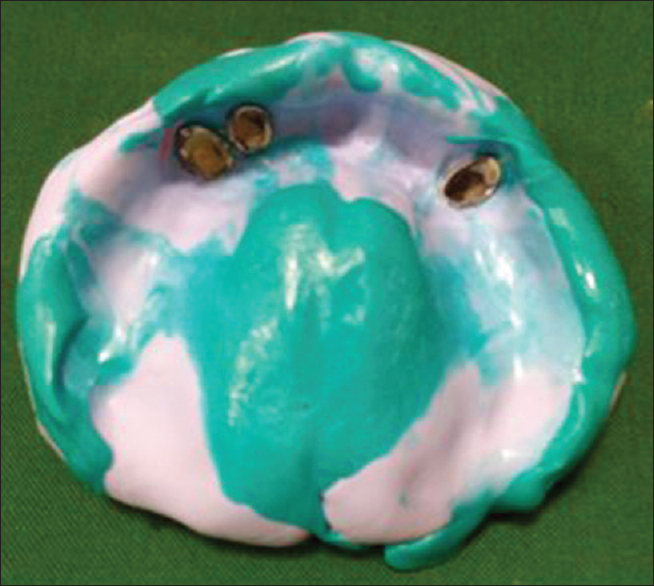 Once the primary copings were evaluated for fit [Figure 6], the copings were luted with temporary cement, and an overimpression was made using the putty and light body polyvinyl siloxane elastomer (Aquasil soft putty/regular set, Dentsply, Germany), and the second master model was made [Figure 7]. This model was to be used for fabrication of the cast partial superstructure. The second master model together with the primary copings was duplicated, and the refractory model was prepared. The cast partial framework was waxed up, which was then cast using a base metal alloy (cobalt-chrome) with the secondary coping overlay of the primary coping. 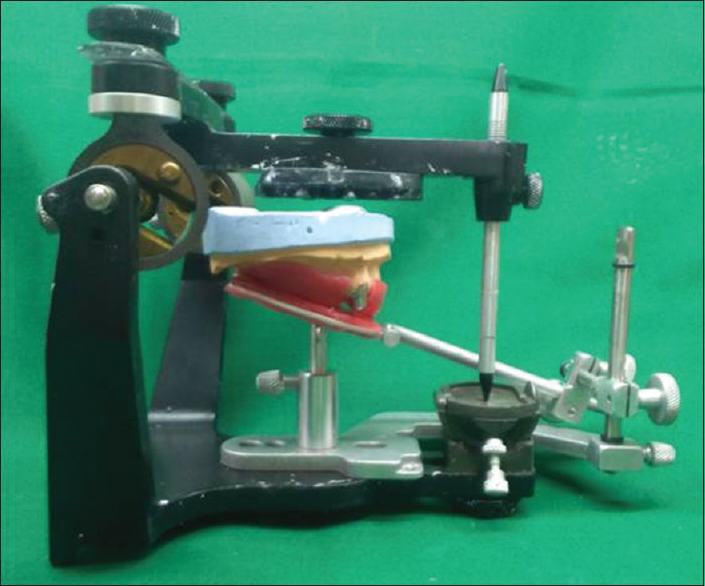 After evaluating the fit of the framework in the mouth, a wax rim was prepared on the framework, the maxillomandibular relationship was made with framework in position, and the models with the copings were mounted on a semi-adjustable articulator using the facebow record [Figure 8]. 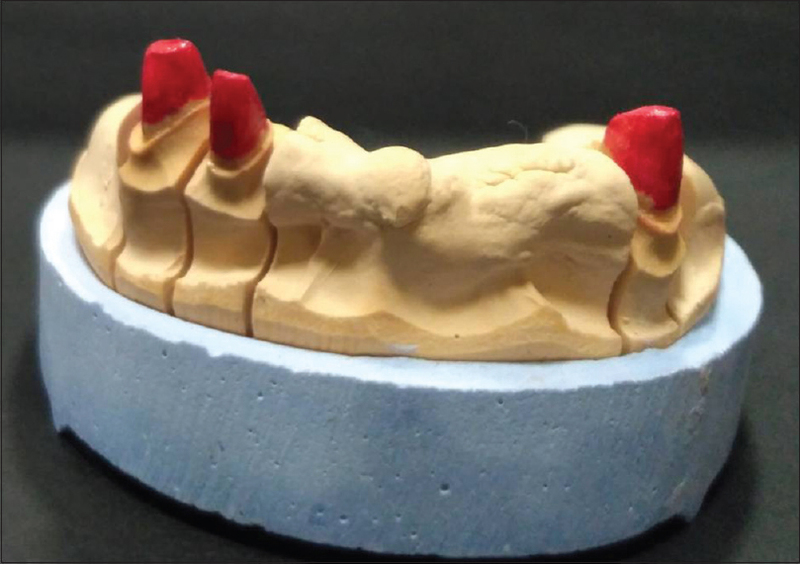 Shade selection was done, prosthetic teeth were arranged with the same shade as were veneered over the secondary coping, and wax try in was done [Figure 9]. 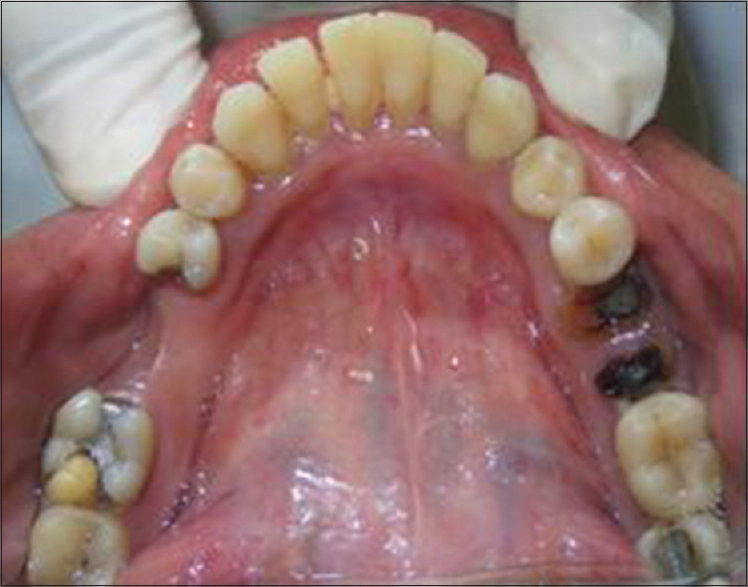 The primary copings were then luted with glass-ionomer luting cement (Type I; GC Fuji). After verification of esthetics, function, and phonetics, the denture was processed. The completed prostheses were evaluated for function, esthetics, and phonetics [Figure 10]. Mandibular teeth were also prepared simultaneously in relation to 35, 36, and 37 and 45, 46, and 47 to receive a porcelain fused to metal restoration and was cemented with glass-ionomer luting cement (Type I; GC Fuji) [Figure 11]. Postoperative [Figure 12] instructions and adequate oral hygiene maintenance were provided. The patient was scheduled on periodic recall. It is of general consensus that teeth, which are considered poor support for fixed restorations, should not be extracted if they can support a denture. As tooth supported over dentures help in improved stress distribution there by maintaining the integrity of residual ridge. The decision to save teeth solely based on whether they could be made comfortably functional or could be modified to contribute to the function of the masticatory system. For a removable telescopic prosthesis, it is recommended to retain at least two teeth on each side of the arch with an existing bone support, not less than half the root. 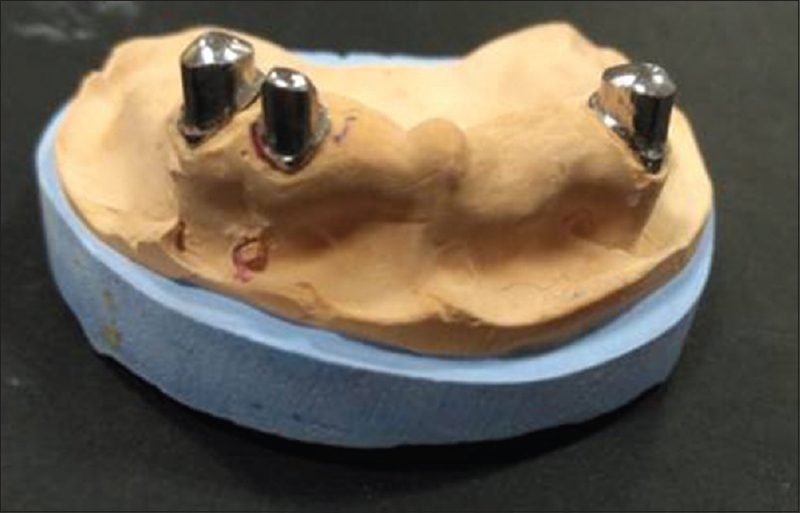 The preparation of the abutment teeth is one of the keys to construction of overdenture. This thimble-shaped approach occupies the greatest amount of vertical and buccolingual space and has a profound influence on the denture design. The retention obtained for the overdenture will vary inversely with the taper of the coping, while the adaptation of denture base to the coping will influence stability as well. Anterior teeth are more sensitive compared to posteriors and can perceive much smaller tactile and pressure stimuli. The canines are stated to be the most richly innervated and sensitive among all teeth and thus become the preferred abutment teeth under overdentures. In addition, due to their long triangular roots, they are retained in the system for a longer duration. 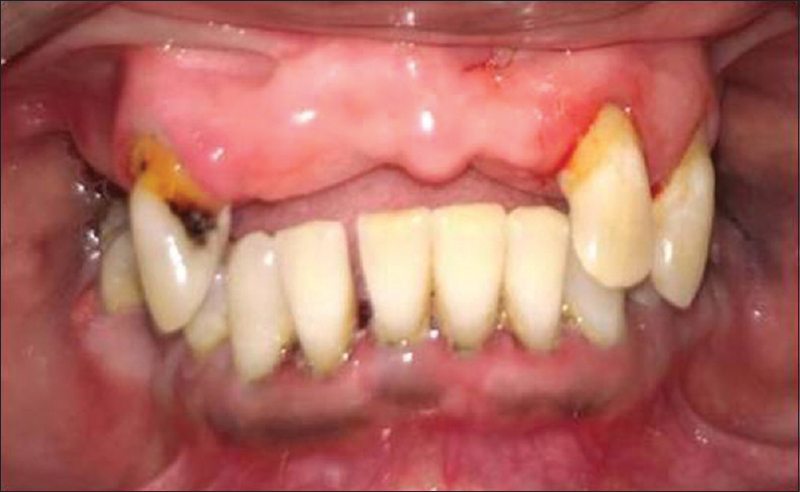 The telescopic overlay denture system used in this case revealed long-lasting usefulness in the prosthetic treatment of the patient with reduced dentition. Similar clinical observations were also described in reports made by other authors. It has been observed by many authors that positive results of prosthetic treatment with telescopic dentures in the patients with reduced dentition and inflammation of periodontium. There are many advantages of telescopic crowns such as an axial load of the tooth and full covering of the abutment (on the contrary to clasps), which may reduce tilting forces with their negative influence on abutment supporting tissues. The axial forces stimulate periodontal tissues and alveolar bone. They also provide indirect splinting influence, easy oral hygiene maintenance, and easy ways of repair. Indirect composite resin veneering was used to restore anterior teeth in the esthetic region. As veneering composite provide adequate shear bond strength, colour stability and longevity., As the tooth supported overdenture has the disadvantage of incidence of caries and progression of periodontal diseases, it becomes obligatory to periodically monitor their health, so extra measures for maintaining oral hygiene and frequent reviews of the prosthesis. A simple, cost-effective treatment for more complex implant overdenture is the concept of conventional tooth-retained overdenture. Although fixed restoration provides favorable conditions for preservation of oral function, telescopic overdenture may be considered as another option, combining good retentive and stabilizing properties with a splinting action. Hence, telescopic prosthesis remedy can be the most efficacious, as well as provide various solutions to clinical problems and a better prognosis for the abutment teeth. Stober T, Bermejo JL, Beck-Mussoter J, Seche AC, Lehmann F, Koob J, et al. 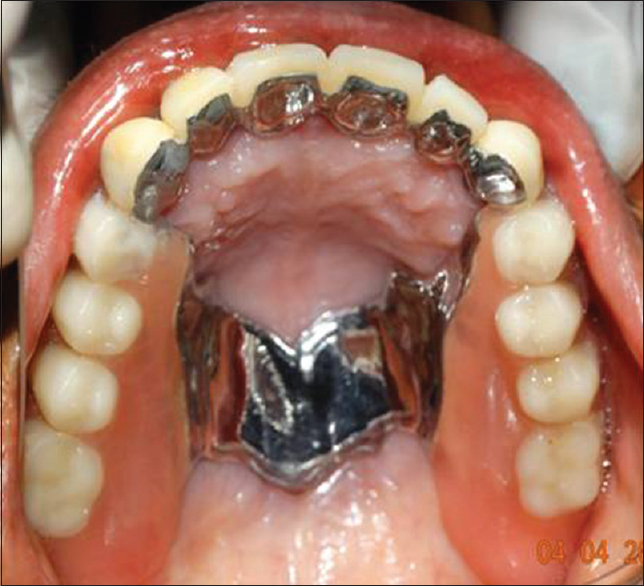 Clinical performance of conical and electroplated telescopic double crown-retained partial dentures: A randomized clinical study. Int J Prosthodont 2012;25:209-16. Goswami R, Mahajan P, Siwach A, Gupta A. Telescopic overdenture: Perio-prostho concern for advanced periodontitis. Contemp Clin Dent 2013;4:402-5. 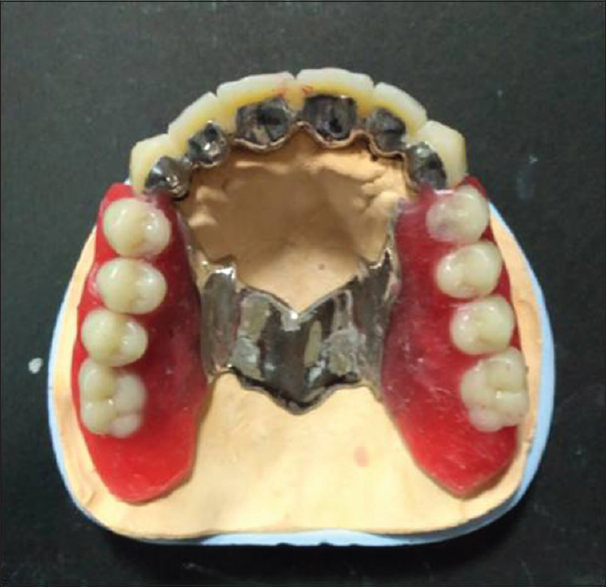 Singh K, Gupta N. Telescopic denture - A treatment modality for minimizing the conventional removable complete denture problems: A case report. J Clinical and Diagnostic Research 2012;6. Dhir RC. Clinical assessment of the overdenture therapy. J Indian Prosthodont Soc 2005;5:187-92. Sharry JJ. Complete Denture Prosthodontics. 3rd ed. US: McGraw-Hill Inc.; 1974. p. 310-9. Hou GL, Tsai CC, Weisgold AS. Periodontal and prosthetic therapy in severely advanced periodontitis by the use of the crown sleeve coping telescope denture. A longitudinal case report. Aust Dent J 1997;42:169-74. Jones RM, Moore BK, Goodacre CJ, Munoz-Viveros CA. Microleakage and shear bond strength of resin and porcelain veneers bonded to cast alloys. J Prosthet Dent 1991;65:221-8. Jones RM, Goodacre CJ, Moore BK, Dykema RW. A comparison of the physical properties of four prosthetic veneering materials. J Prosthet Dent 1989;61:38-44.